Gabriela Rep. Arlene Brosas slammed the Miss Universe pageant in a prepared statement that she read during a press conference on Wednesday, January 11. Brosas was quoted in a report by Marc Jayson Cayabyab in Philippine Daily Inquirer: "Gabriela opposes pageants and other festivals that exploit women and as these are tools to commodify women and use the competitions to promote commercial use of women’s image in marketing products and services on a globalization-oriented trade regime." Brosas added that the country's hosting of the beauty pageant is an "expensive exercise to lull the people and the international audience into a false sense of well-being and celebration" and a "manipulative and deceptive tool that projects an image of peace and stability to cover up the creeping influence of fascist repression of poor women’s rising protests." Former Miss Philippines Earth titleholder Imelda Schweighart lauded Gabriela's stance against Miss Universe. In a Facebook post published on Thursday, June 12, Schweighart wrote, "Kudos Gabriela! I'm with you. You are right." Schweighart added, "I remember wearing my two-piece with the rest of the candidates backstage held here in the Philippines, the recent international pageant I was in. We were like meat waiting for our turn to strut our stuff just to surpass the segment." She continued, "I cannot deny the look in these girls' faces backstage and the act we have to put out there on stage. 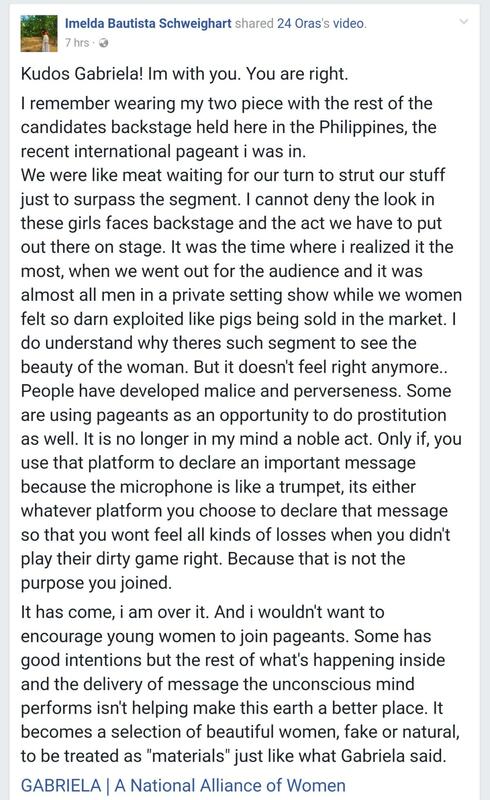 It was the time where I realized it the most, when we went out for the audience and it was almost all men in a private setting show while we women felt so darn exploited like pigs being sold in the market." Schweighart's post has since been taken down, but netizens managed to take screenshots.